In this post, I want to discuss what I have been working on and show you how to approach still life photography differently. The subject for this shoot is the perfume bottle. It’s complemented by several geometric shapes in this set design. In the video, you can see my setup today and the items and arrangements I have gone with. I am really enjoying using the perfume bottle as my subject lately. I tried maybe several different angles and setups to get the final set in place. The geometric shapes were assembled around the perfume bottle, with the square block of wood as the base. I feel like the colors probably match fairly well. After shooting several images I decided to change the position of the bottle from straight up to suspended. Because I like ‘crazy’ designs. ‘Crazy’ can be sometimes good at photography. Two lights were placed high up above the scene, with 20 degrees honeycomb grids. This steep, almost distant light creates sharper contrasts in the edges of shadows. Another light was set up on the side shining horizontally on the surfaces. A final light was placed to illuminate the white backdrop. I tried different things with my bare hands, you can see me doing so in the video. Similarly, I kept moving the cards around until I found an angle I was happy with. Furthermore, lighting is so crucial for capturing those quality images. One should take the time to position and set up this properly. 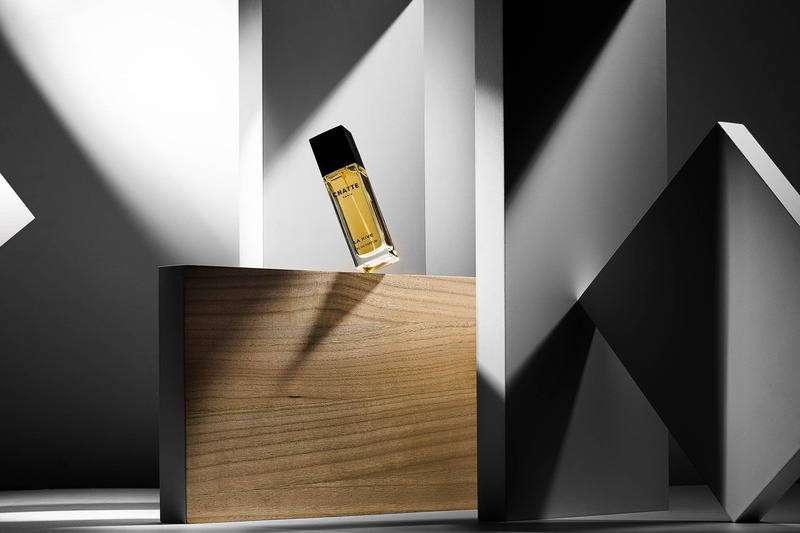 The perfume bottle appears to be balancing on a single corner of its casing. The wooden block is lit up from the front, showcasing the texture in the wood grain. While the accompanying geometrics shapes are starkly contrasted with brushes of dark shadows. The objective is to create a strong first impression. This is even more important for commercial photography where we want the brand to be central. The perfume bottle was suspended with fishing line and rotated around as I took the photos. Above all, the spinning allowed for multiple different results. I certainly like to try different things when I shoot still life. For me, it’s important to play with the shadows and lighting to create different results in the images. You can see some of these results in the video. Eventually, I settled on one image and did some light touch-ups. I am very happy with the result.